The young actor Yeo Jin Goo who plays the role of crown prince Lee Hwon in MBC drama The Moon that Embraces the Sun transformed into a hip-hop dancer. Recently on an online community, a thread with the title of “The look of Yeo Jin Goo is one hundred percent high school student” was posted, together with a photo. 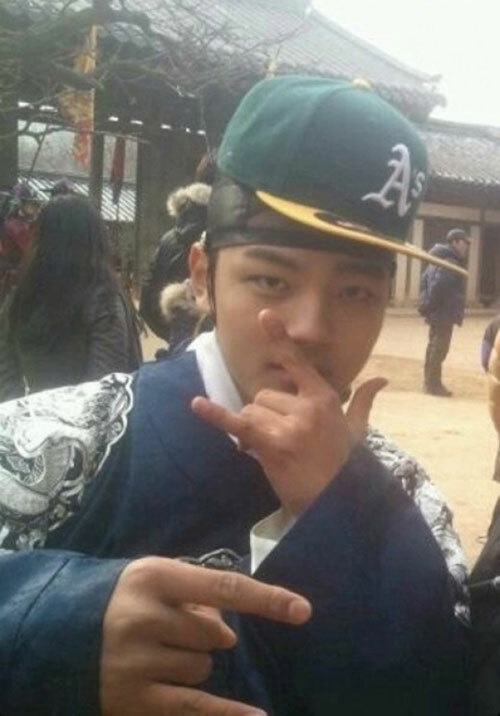 In the photo, Yeo Jin Goo appeared to be in the crown prince costume of The Sun and the Moon drama, but he was wearing a hat on his head, instantly created the hip-hop atmosphere, and he showed the hand movement of the hip-hop dancing, provoking laughter. Netizens who saw the photo said, “Crown prince can publish a hip-hop special pictorial edition,” “so cute,” “it’s a pity that from now on I couldn’t see you again,” “well-loved crown prince,” and so on. On the other hand, the young Yeo Jin Goo is gaining high popularity through the astonishing display of acting in The Moon that Embraces the Sun.